This acoustic/electric nylon-string Grand Concert from our Academy Series may be the best nylon-string guitar you’ll find for the money. 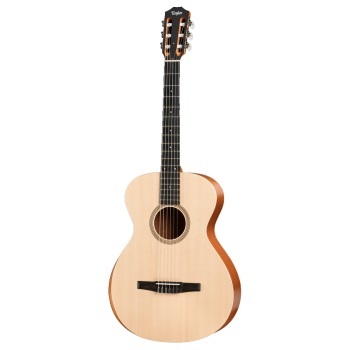 The underlying design goal of the series is to make the acoustic guitar accessible to more players by bringing Taylor’s legendary playability and tone into an affordable price range. One of the benefits of a nylon-string guitar is that the light string tension is easy on the fingertips. Another inviting feature is a built-in armrest to enhance the playing comfort. Tonally, the wood pairing of layered sapele back and sides with a solid Lutz spruce top, together with the body’s internal bracing, project a warm, mellow nylon voice with crisp percussive appeal that suits a variety of musical styles and responds well to both fingerpicking and flatpicking. The onboard ES-B pickup includes a convenient digital tuner with an LED display for tuning and low battery indication. Whether you’re a steel-string player looking to add an affordable nylon-string to your acoustic toolbox or crave a great-sounding acoustic guitar that’s easy on the hands and the wallet, the A12-N is an option well worth exploring.